At this point, we've done a thorough investigation into domestic familiarship. I've outlined the various kinds of familiars you might encounter and explained the difference between a pet and a domestic familiar. We've talked about how to form a pact, what the familiar does for the witch and what you might need to offer in return. This comprehensive series is still far from complete, however. Before getting to the death of a familiar and the end of the pact, I'd like to discuss a few key points. Today's topic? The domestic familiar and ritual. In part four, I listed the many ways in which a domestic familiar will serve the witch, ranging from basic grounding and protection to venturing across the veil and deep into the Other. While these can be applicable to ritual, ritual is more than mere spell work. In fact, I've outlined 11 different purposes of ritual here. It may be worthwhile to read that article before continuing. 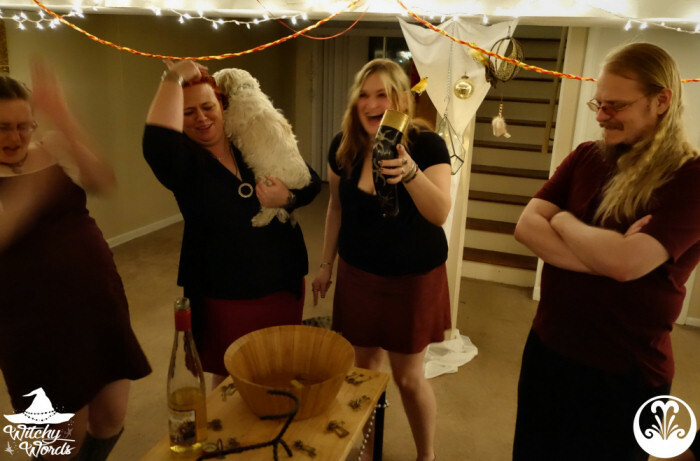 Familiars can participate in ritual through a variety of ways. A lack of opposable thumbs shouldn't hinder them from introducing energy, calling upon a spirit or deity or tracing the outline of the circle with you. That being said, your familiar should willingly participate. Never trap your familiar inside a room or push them into participating in a ritual. Consent should be honored; you might even go as far as to add it as part of your pact. Your familiar will take part in the rituals they deem necessary. If you would like them to participate, you should initiate a discussion to see if they would be interested. Familiars have the autonomy to leave a room when they feel it necessary but, unlike humans, familiars are welcome to cross the boundary of sacred space without tampering with its stability. There are a couple reasons for this. The first is the difference between how a familiar perceives their vessel and how we see ours as humans. Humans may be spirits in a meat suit but we're awfully tied to our bodies in this life. When our bodies cross that physical barrier, so do our souls, our energy and our subconscious. The same can't be said of animal familiars. Their bodies are more vessels. They sleep more often, spend more time in the Other during their lifespan and have shorter lives than we do. Their body is a temporary shelter for the physical plane. So when your animal familiar crosses the barrier of sacred space, they're less likely to break said barrier. 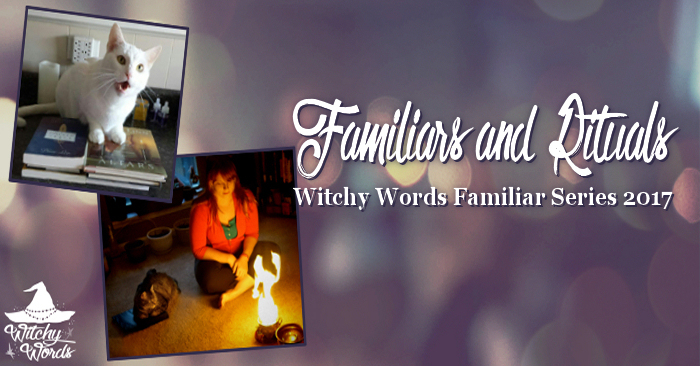 The second reason is that familiars are an extension of the witch. By being pacted and connected with the witch, that familiar is welcome to come and go as they please without threatening the casted circle. You are the root and your familiars are the leaves. The leaves come, go and return as needed. As long as the root stays in place, nothing has changed. Think of it like calling upon any other non-corporeal entity like, for example, a deity. You are not trapping that deity within the circle. They are welcome to come and go as they please throughout the ritual without breaking that barrier. The same applies to spirits of any kind, even your familiar. 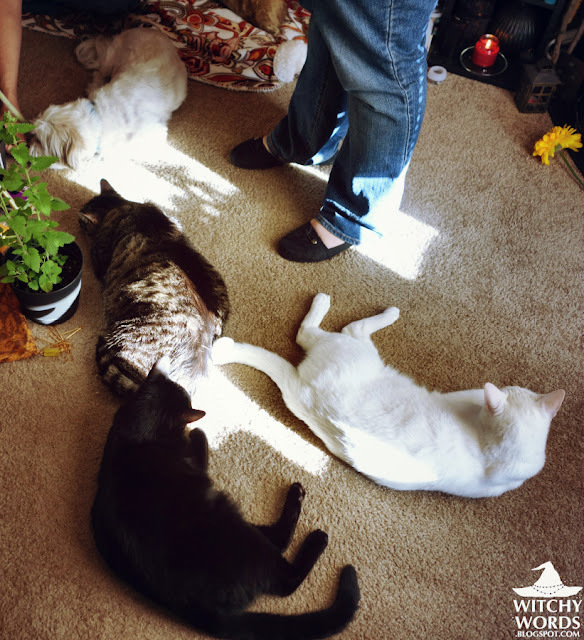 A familiar's ability to cross the lines of the circle can come in handy during a ritual. Depending on the size, training and knowledge of the familiar, you can have them bring outside energy in, remove things from the space and retrieve forgotten tools. All of this is incredibly special to the work. With one foot in the Other and a loose tie to their vessel, your familiar's ability to communicate with non-corporeal entities is, generally speaking, naturally stronger than yours. 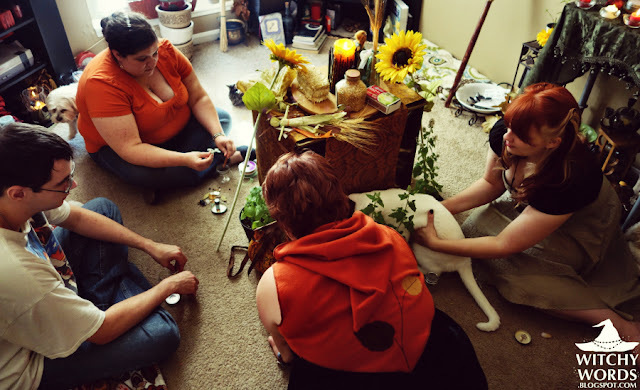 In facilitating ritual that involves spirits, fae, deities or other such beings, familiars can assist in drawing those entities in and making your needs known. This is particularly helpful if that entity doesn't speak the same language you do as domestics seem to speak a universal language that crosses most barriers. This also allows your familiar to protect you against entities that tend to play tricks, manipulate or wish you harm. In this, a domestic familiar can serve as a second line of defense to your casted circle and/or wards, much like your personal witchcraft bodyguard. For the witch that desires external connections during ritual but either has no local community or doesn't want one, familiars can serve as exactly that. Your familiar can add discussion, guidance and creation to your rituals, developing and facilitating deeper and more meaningful ceremonies. Their presence can add extra energy and they can serve for calling upon quarters and deities as if you have multiple covenmates. For some rituals, your personal presence isn't always needed. I'm specifically thinking of rituals that involve crossing the Other, astral travel, trancing and possession. As I've mentioned multiple times, familiars have one foot in the Other and assist the witch in crossing those boundaries. Rituals that involve such can help you jump the hedge more easily. In rituals that involve possession, your consciousness needs somewhere to go. Perhaps you can blank out to a corner of your body or your special astral address but, for those with a pacted familiarship, you could also request access to your familiar's body. Possessing your familiar gives you an out to explore your home and the world around you while your body is utilized by the spirit at hand. Think of it like having a loud house party at your apartment. Familiars create extra rooms only you can access when you need to get out of the crowd. The Pact: The very first ritual you and your familiar perform should be your pact, which I've discussed at length here. 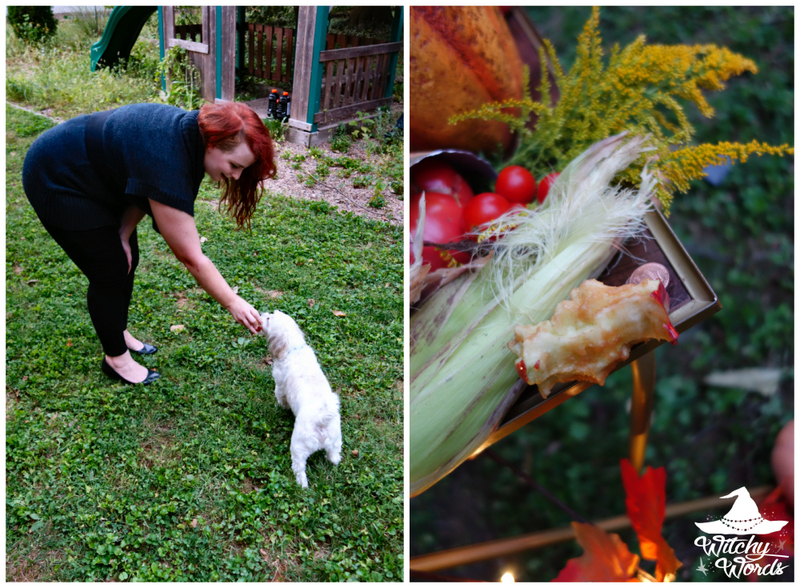 Dedication: Setting up a ritual to dedicate your familiar to a spirit or entity of their choice could be the next step. Perhaps you're dedicated to a particular deity. Both your familiar and your deity of choice may decide that your pact necessitates your familiar's dedication as well. If both consent, this is likely your next step with your familiar. Energetic Exchange: Regular energy exchange outside of ritual should be the norm. This solidifies the bond you and your familiar have. Ritualistic energy exchange should also take place. This allows you to set up protective barriers and fully focus on energy exchange in a safe and stable environment free from interruptions or problems. Of course, never ever take or give energy without your familiar's consent. Trance and Possession: Once you are comfortable with one another's energy and the exchange comes easily, the next step is to travel through your familiar. Set up a ritual to protect yourself as you trance and enter your familiar's body. Stay only for a short time, increasing it as you and your familiar's bond strengthens over time and exchange. Your familiar may want to do the same. This kind of mutual possession gives you a wider array of spiritual activities you can accomplish. Healing: Healing rituals are common between witches and familiars. If you are particularly sick, your familiar may wish to spiritually assist you in your wellness. The same can be said in return. While you two may exchange bits of energy here and there, as I mentioned earlier, a ritual allows a greater exchange in a stable and safe environment. Healing rituals and the metaphysical, of course, are never a substitute for seeing a vet or doctor. They should be done in conjunction with physical world efforts. These are some generic ideas for facilitating ritual between you and your familiar once the pact is made. Ritual needs will vary between every familiar with no two being exactly alike. You two may not be comfortable with all of these or you may come up with other ideas together. Whatever you do, ritual will likely become a solid part of you and your familiar's relationship. My familiar skrinkels starkitty has asthma he's 7 and has just been diagnosed. He's been given medicine but I know I can do more.im barley into my second year, I'm not in a coven nor do I know personally anyone else who is involved in the religion. That being said is there any way you could give me some suggestions(on here or in a private message) as to what I should do as a ritual to heal him. He is a water sign. His love has been the single most spiritual and truth I have or ever could experience. Any help would be great. In practice Bast has been the main god i relate too. My familiar also holds Bast as his favorite feline deity and feels a strong connection to amun Ra. Thank you in advance for your page and any help or tips you can give me. Blessed be. My Zeus also has asthma, so I certainly sympathize. There are a lot of ways to manage feline asthma, though I should caution that I'm not a vet and my advice should not be taken in place of veterinary care. For Zeus, we try to keep his environment as stress-free as possible to prevent flair-ups. You could incorporate catnip or a relaxing pheromone into a healing session with your kitty to combine a natural aid with magic. Some owners find that cats respond well to warm, moist air as it helps to clear the airways. Try taking a cleansing shower and allowing your cat to stay in the bathroom with you. Envision cleaning him as he relaxes outside of the shower. Never force your cat to stay in with you or to join you in the shower - not only would this increase his stress but it may not end well for either of you! Some cats with asthma are prone to obesity. Consider incorporating toys into a ritual. For example, when casting the circle, use a feather wand to guide your cat quickly around the area. Because asthmatic cats struggle with smoke, perfumes and other inhalants, I would find alternatives to smoke cleansing and oil diffusers. Salt water in a bottle could replace sage bundles. Adding a drop of oil to some bee's wax in a small container that you might be able to either smell during ritual or apply under your nose can help you still have certain scents without hurting your familiar. Some asthmatic cats respond well to low-dust litters, a hypoallergenic diet and/or supplements added to their diet such as Omega-3s. I would discuss all these options with your vet first. Also, if you ever hear your cat making a high-pitched squeaking sound or notice his tongue sticking out during an attack, get him to an emergency clinic as that may mean he cannot breathe. I wish you the very best of luck with your familiar! My girlfriend's familiar, Colugero (he's a cat!) has suddenly changed his attitude. He's started hissing and even bit her roommate! Like he's picked up some negative energy from someone. My question, is there a best way to cleanse your Familiar? Blessed Be!